Manager’s Agenda #1. A communication transmitted from Louis A. DePasquale, City Manager, relative to the City of Cambridge retaining its noteworthy distinction of being one of approximately 33 municipalities in the United States with AAA ratings from each of the nation’s three major credit rating agencies. This has become an annual tradition, and it’s still something we should celebrate. Manager’s Agenda #7. A communication transmitted from Louis A. DePasquale, City Manager, relative to a request for the City Council vote to approve the use of the new voting equipment and to discontinue the use of the existing voting equipment effective immediately. Communications & Reports #1. A communication was received from Deputy City Clerk, Paula Crane, transmitting a report for a City Council public hearing held on Tues, Feb 20, 2018 for the purpose of the City Council and the public to view the new voting equipment purchased by the Election Commission. We first used the current AccuVote machines for the Sept 1996 State Primary, and they were a huge improvement over the punchcard system we used prior to that. It was necessary then to have some custom programming done so that the same scanners could also be used for the municipal PR elections, and that will again have to take place with the new ImageCast machines. That’s just for creating the ballot data text files. The election tabulation will continue to be done the same we’ve been doing it. In addition to firming up our system for our own sake, it’s worth noting that with Ranked Choice Voting being advocated in Massachusetts and elsewhere (though not necessarily PR), what we do in Cambridge may be helpful down the road in other places. Charter Right #1. A communication transmitted from Louis A. DePasquale, City Manager, relative to the Final Landmark Designation Report for the Hovey & Markham Cottages as follows: 2A. Property located at 40 Cottage Street; and 2B. Property located at 44 Cottage Street. As I said a couple of weeks ago, whether a building is landmark-worthy should depend only on the building and not on its owners or occupants. Update: The City Council landmarked only one of the two properties (44 Cottage Street) and sent the other (40 Cottage Street) to Unfinished Business even though the landmarking only makes sense as the pair of buildings. Apparently, these councillors believe that landmarking is a function of whether they like the property owner or not (and whether they supported you politically). Suffice to say that I have great respect for all who voluntarily serve on City boards and commissions out of a sense of civic duty rather than single-issue advocacy. Bill King is one of those people who has consistently defined over many years what it means to be a great citizen. Communications #7. Sundry e-mails received on support of the protected bike lanes, relative to Policy Order #4 of Feb 12, 2018 Council Meeting. Copies are on file for review in the City Clerk’s office. I generally ignore all emails that are the product of a coordinated campaign with a list of "talking points", but I did happen to read one of these sundry emails that stated "You will see no slander in comments from the people who support the new infrastructure." I am reminded of the statement "Fortunately time takes care of old people for us" stated by one particular idiot who didn’t appreciate the criticism by older people of the Cambridge Street configuration. PS – Former Mayor Alice Wolf submitted a late communication at the previous meeting with specific objections to the current configuration of Cambridge Street and the suggestion that a better configuration should be found. The Cambridge Bicycle Committee was created from her initiative, so let’s put to rest the claim that criticism of this configuration is a fringe phenomenon of "the anti-bike people". Manager’s Agenda #8. A communication transmitted from Louis A. DePasquale, City Manager, relative to Awaiting Report Item Number 18-16, regarding a report on Inman Square construction. Synopsis: The City is very interested in your ideas about the color of the sidewalk and what varieties of flowers should be planted in the vicinity of the planned reconfiguration of Inman Square that is not subject to any compromise, discussion, or alternative perspectives. I agree with this Order, but not just in the situation of "proximity to land-uses serving vulnerable populations". Some streets warrant lower speed limits simply because there is fast-moving traffic directly adjacent to a narrow sidewalk, e.g. westbound on Putnam Ave. When Prospect St. used to have an additional lane with neither a buffer nor parking it was very dangerous, especially close to Central Square. On-street parking can, in fact, be very effective in traffic calming – even moreso when speed limits are reduced. It would be great if the City and our various government representatives could find a way to make this happen, but not in the absence of either a new commuter rail stop or shuttle service or both. It will be very difficult to sell this proposal simply as a pedestrian and bicycle amenity (as has often been done), so I’m glad to see this phrased as it is. Contained in this letter is also one point of view that there should be a grade crossing of the railroad tracks (or underpass or bridge) at the western end of Cambridgepark Drive. You’ll never see a new grade crossing approved there, and an underpass is unrealistic. As for a bridge option, it’s only realistic to imagine one new bridge over the tracks and (even though I may like it there) all the proposals I’ve seen in the last few decades don’t have it that far west. 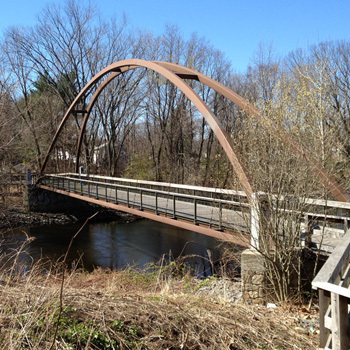 The letter also suggests a pedestrian bridge over the Little River. Except for the usual difficulties associated with building anything near a waterway, that bridge would be relatively easy to build and inexpensive. 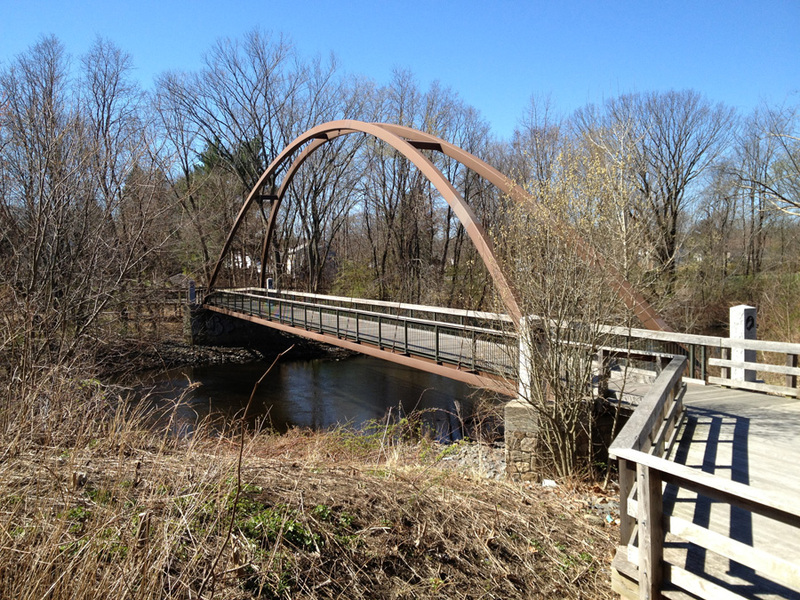 See picture (Blue Heron Bridge over the Charles River between Newton and Watertown – Wikipedia). Update: City Manager Louis DePasquale hinted at the possibility of some movement but gave no specifics. Everybody is intrigued about what he was driving at. It’s curious that the authors of this Order chose not to specify what form of "Right of First Refusal bill" they want. There are good reasons why House Bill 3017 never made it out of committee. Do the authors simply want the City Solicitor to provide language that’s the same as H.3017 or do they want a Home Rule Petition that is fundamentally different? It would be nice if the focus was primarily on providing options for long-term tenants rather than on creating a framework for ensuring that private property in select neighborhoods is transferred to public/quasi-public ownership. Update: Councillor Simmons exercised her Charter Right on this vacuous Order. This Order brought out more people during Public Comment than everything else on the agenda. In 2017, Cambridge installed a two-way separated bikeway on Brattle Street between Mason Street and Brattle Square. In the video here, I take a look at part of that bikeway, from Church Street to Brattle Square. This is a high-definition video. For best viewing, start the video playing, click on “Youtube”, and then click on the Full Screen Icon — the square at the lower right. The battle for turf in the Rhetorical War continues this week with troops massing at the borders over the meaning of Vision Zero and Safe Streets. Continents could be sinking and frogs raining from the sky, but we’ll once again get to witness the turf war over allocation of space on Cambridge roads (and sidewalks). Word has it that the Boston Cyclists Union has already rung the alarm and asked all troops to report for duty in the Sullivan Chamber on Monday to argue against "safe streets for all" if that might translate into giving up an inch of sand on the beachhead of segregated bike lanes. It makes for an interesting juxtaposition with the City hosting a Big Press Conference this past week announcing its Vision Zero Plan – basically reducing the speed limit to 20mph in the major Squares (a good thing) and creating a rhetorical framework to hush up anyone who questions future road reconfigurations. After all, you know, Vision Zero. If you don’t like flexi-posts or traffic congestion or if you raise issues about road conditions in winter and safety considerations at intersections, surely you must be against traffic calming and in support of danger. Public Comment on Monday promises to be great (that is to say – bad) theater with about a 30 year age difference in opposing sides in the battle over the definition of safety. Frankly, I’d rather talk about public transportation, but that would have far less drama. I was also unable to witness the presentation last week on the Battle of Inman Square that pitted tree huggers vs. bicycle segregationists (which actually pitted some people against themselves) in the elusive redesign of this crossroads. Manager’s Agenda #1. A communication transmitted from Louis A. DePasquale, City Manager, relative to the Final Landmark Designation Report for the Lechmere National Bank building at 225/227 Cambridge Street. Manager’s Agenda #2. A communication transmitted from Louis A. DePasquale, City Manager, relative to the Final Landmark Designation Report for the Hovey & Markham Cottages located at 40 and 44 Cottage Street. Communications #3-10,12-17. Fourteen letters opposing historical landmark designation of 40 Cottage Street. We are blessed with our most excellent Historical Commission who generate landmark designation reports (and other publications) that are incredibly good. These two reports are no exception. In a city with so many significant historic buildings it’s not surprising that the Historical Commission is recommending landmark status in both of these reports. What makes this noteworthy are the communications – many of which were generated from the same template. Some of them even make reference to the "weaponization of the Historical Commission landmark study and designation process". Personally, I hope the homeowners of 40 Cottage Street will be allowed to renovate their home to the highest energy efficiency standards while maintaining as much historical integrity as possible. That said, either your building is landmark-worthy or it’s not, and I’d say the report strongly suggests that this one is. It’s true that various legal processes are routinely used in Cambridge to stall or block projects, but I guess it apparently does matter whose ox is gored. If you know the right people then it’s called "weaponization", and otherwise it’s called "neighborhood preservation". In any case, it will be good to hear more about how the Historical Commission balances preservation vs. modernization in a time when energy conservation and sustainability are prioritized. Manager’s Agenda #4. Transmitting Communication from Louis A. DePasquale, City Manager, relative to the appropriation of a Sustainable Materials Recovery grant from the Massachusetts Department of Environmental Protection in the amount of $38,800 to the Grant Fund Department of Public Works Other Ordinary Maintenance Account which will be used toward the purchase of food waste collection bins for the citywide curbside organics program. The starting date is now less than two months away. Speaking as the man formerly known as "Compost Man", I’m eager to see how this plays out and what problems arise as this service is rolled out citywide. I’m also mindful of the fact that this is just as much a rediscovery of former best practices as it is of innovative new practices. Manager’s Agenda #5. A communication transmitted from Louis A. DePasquale, City Manager, relative to Awaiting Report Item Number 17-111, regarding the feasibility of implementing neighborways. In short, the report doesn’t endorse using art to calm traffic. We had a good way of handling this when I was a kid growing up in Queens, New York. We painted bases and baselines on the street and played stickball. The message to drivers was abundantly clear and there was never an altercation. We would also chant "Car Car C-A-R" when a car was coming. Other streets had hockey goals in the street that had to be moved to allow cars to pass, but nobody ever complained. We never called these "neighborways." We just called them streets. Manager’s Agenda #7. A communication transmitted from Louis A. DePasquale, City Manager, relative to Awaiting Report Item Number 18-01, regarding a report on possibility of a supermarket opening at 20 Sidney Street. Perhaps nothing will come of this, but at least there’s this: "Community Development Department (CDD) staff have reached out to real estate representatives at several grocery chains, including Market Basket, Aldi, Trader Joes, and bFresh to inform them about the opportunity and connect them to Forest City. Several grocery store representatives mentioned that they do not have plans to expand at this time, or that the space is too small for their traditional size requirements. Regardless, CDD staff has relayed the grocery store chains contact information to Forest City staff. Staff will continue to explore options and communicate with Forest City about possible tenants.” In my view Aldi is the one that might work best at this site, but only if the rental agreement makes it economically feasible. Perhaps we can just dispense with the supermarkets and just buy our milk and eggs from Farmer Jones down the street. When I was on the Recycling Advisory Committee (22 years, I believe) I often learned how some initiatives that were very appealing were actually counterproductive or, at best, a break-even proposition. For example, a "paper" drink cup is still lined with plastic, and when you take away the paper there is still a significant amount of plastic – perhaps more than in a "Styrofoam" cup. This Order asserts that expanded polystyrene (EPS), a.k.a. "Styrofoam", has been shown to leach harmful chemicals into food and beverages, but most reliable sources dispute that or note that any potential hazard is negligible. The real problem is that it’s difficult to recycle economically and it doesn’t really biodegrade. Regarding the ban of plastic bags, except for the fact that the plastic gets caught in the machinery at the materials recovery facility (MRF), the environmental benefits of paper bags over plastic bags is not a slam dunk. Reusable bags, on the other hand, win the argument easily. That’s why the Cambridge ordinance is best referred to as the BYOB (Bring Your Own Bag) Ordinance rather than as a plastic bag ban (which it isn’t). The jury is still out regarding the polystyrene ban. Some places now provide "compostable" plasticware, but recyclers aren’t keen on it because it doesn’t really biodegrade along with other organics except under very specialized conditions. Also, biodegradable plastic is often hard to distinguish from other plastic and this compromises the recyclability of all plastics. I suppose none of these details matter to city councillors as long as it makes them appear "environmental". I am, of course, interested to hear what DPW has to say about how the polystyrene ban has fared. A critical part of the process will be evaluation of this corridor, both to make adjustments for future installations and to help stakeholders understand how this demonstration project is working. To provide adequate time for users to adjust to the changes, we expect the demonstration to last at least six months, after which we will make decisions about whether to retain the demonstration as a permanent improvement and whether any changes or tweaks are required based on the performance during the demonstration period. Ability to maintain bike path, in winter and for street cleaning. In other words, there was always supposed to be a evaluation of this Separated Bicycle Lane Demonstration. It’s interesting that at least one city councillor seems unable to grasp this in saying, "The protected lanes are here to stay and this order may suggest to some they are not." There is little question that enhanced bicycle (and pedestrian and motor vehicle) safety is the rule of the day (because, you know, Vision Zero), but the question remains how best to achieve this. Furthermore, saying that an evaluation will be "data driven" is insufficient. For example, banning all motor vehicles would surely produce data showing a reduction in motor vehicle crashes, but that would not imply that the ban was good policy or that a better solution was not possible. Perhaps nobody wants to hear this but there really are currently two feasible options available for Inman Square. One is the "current plan" to wipe out the trees in Vellucci Park, relocate some of that space to the north side, and move all bicyclists onto the sidewalks. The other is to keep Inman Square more or less as it is with its newly painted green stripes for bicycles and maybe with some tweaking of the signals, lane markings, and pedestrian phases. Do we have any safety data on how the intersection is working since the "temporary" changes were made last year? Translation: Some advocates want municipal broadband whether or not there is the demonstrated need or demand, and the fact that Cambridge has a significant "free cash" position will be perpetually used to justify any required expenditures. I also wonder sometimes what fraction of people nowadays use only their phone to access anything online (and to, of course, post silly pictures). Committee Report #1. A communication was received from Donna P. Lopez, City Clerk, transmitting a report from Councillor Carlone and Councillor Kelley, Co-Chairs of the Ordinance Committee, for an additional public hearing held on Jan 24, 2018 to discuss the Zoning Petition filed by Peter Kroon, et al, to amend Section 20.50 of the Zoning Ordinance in the " Harvard Square Overlay District" dated Sept 28, 2017. This might win the all-time award for longest committee meeting leading nowhere. At least we now know how many angels can dance on the head of a pin. The following table shows the total campaign receipts and expenditures for 2017 Cambridge City Council candidates. You can sort by any of the fields shown by clicking on the field name – one click ascending and second click descending. Figures reflect the period from Dec 1, 2016 through Jan 31, 2018. Note 1: Figures reflect the period from Dec 1, 2016 through Jan 31, 2018. Note 2: Adjustments to the totals have been made to reflect returned donations, candidate loans repaid, etc. Note 3: There will be no additional updates except for corrections. This table is meant to give an idea what the actual total receipts and expenditures are for a full municipal election cycle. The choice to use a 14 month period is somewhat arbitrary but reflects what seems to be when campaign activity starts up and winds down. The following table shows the summary bank reports for 2017 Cambridge City Council candidates. You can sort by any of the fields shown by clicking on the field name – one click ascending and second click descending.